My mobile phone lights up and vibrates with a new text message. How does she do that? Type so quickly, almost instantaneously. But we’ve had this conversation before. Maybe she has the text on instant recall. My phone doesn’t have this feature and so I slowly tap out my reply, backspacing and re-tapping my typos. My friend and I are two different beings when preparing for a trip. She’s a Planner. I’m a Pantser. A Planner is someone who researches and maps out every detail of a trip. They consider each aspect of their journey and etch out an itinerary with all hours spec’d out. They know the place’s history, the must have foods and must do activities. They pack their luggage three days ahead of time. A Pantser packs three hours before departure. OK. OK. Maybe I do myself discredit. I do have some short-cuts in preparing for a trip. I have a checklist of things I must pack and stuff I must do. I build on that list, incorporating corrections to mistakes from prior trips. Mistakes like forgetting essentials, like reading glasses, toothbrush and toothpaste or preferred conveniences like full-sized bars of soap (to circumvent those evil slivers of hand soap and un-lather-able shower gel.) I pack first aid items of antiseptic wipes, antibiotic cream and miniature sewing kits. I have ziploc bags pre-filled with un-mime-able-in-an-emergency supplies of feminine product, antacid and Imodium. I also have a list of clothes (clean or near so) that I can throw into the suitcase just before leaving. It helps that I know enough to not pack for activities that will never occur. I don’t pack for cruise ships and dinner theater. I don’t need strappy sandals, beady handbags or high heels. I do pack hiking shoes, dark glasses and cotton scarves. Hiking shoes because it’s always hot, dusty or muddy. Dark glasses because traveling in an open tuk tuk is the surest way to get dirt in your eyes. 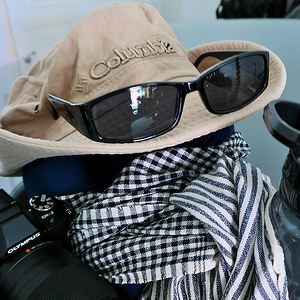 Cotton scarves because they work as sunscreen, gear cleaner and ground cover for outdoor photo shoots. I always bring a small purse to hold local currency. Something small enough to hold a room key, a take-me-home card and change for bottled water. I also scribble down the value of each bill note and sort them into bundles according to denomination. I never adequately prepare for the places I’m about to visit. I used to buy travel books and pour over the glossy pictures and hi-lights. I used to tote these volumes on the trip, adding unconscionable poundage to my carry-on. But then I realized that I never actually read them. That anything listed was assuredly included in bus tours. Tourist expeditions for which I would assuredly never sign up. Not since that first time on the Yellow River Dam, where I was held captive in a tour bus and tortured with details of dam construction, shouted through a tinny megaphone in loud and incoherent Chinese. Instead I do research after the fact, when I look at my pictures and review my trip notes. I look for the reasons why the Padaung women wear neck rings and why there’re so many refugees on the Thai borders. I read up on the Vietnam war and why my Hanoi Kids city guide had such a different view from my Saigon photo guide. I research the White Buildings of Phnom Penh and the withered ideals of Le Corbusier’s Utopian city. Maybe in the process of not planning the trips, I miss the big ticket tourist items. Like The Grand Palace of Bangkok or the gilded Schwedagon Pagoda of Yangon. I miss the crowds and the press of tourists clambering for two fingered selfies. No. I miss it not. My mobile shudders again with a new message. Aiyo! I forgot to check my checklist two weeks ahead of time.